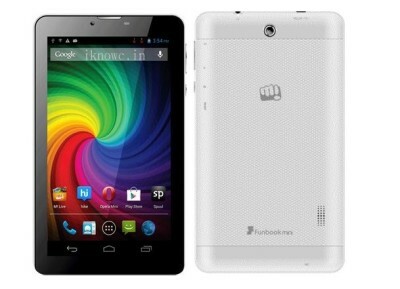 Micromax is wants to pumps up its sale by recently launched Funbook Mini P410. It is the first tablet from the company with Dual SIM support. So finally Micromax wants to please the users by launching devices with fair specifications at budget price. Its the next tablet from the company after the Canvas TAB P650. It comes with dual SIM card slots with Voice calling and 3G support. The Mini P410 would compete with Kobian Mercury mTAB 10, Domo Slate X3G 4th and iBall Slide 3G 9728. The Micromax Funbook P410 Mini comes with a 7inch LCD capacitive touch screen display with 1024 x 600 pixels resolution, to please users eyes. It packs with 2 megapixel rear facing camera and a VGA front facing camera. The device draws the power from 1 GHz dual core processor paired with 1GB of RAM and runs on Android v4.1 Jellybean operating system. It comes in white color and with 4GB of internal memory. The device is powered by 2800mAh battery which will last for 4hours on Internet surfing. Micromax P410 Funbook mini features Dual SIM capability to make voice calls, 3G HSDPA 7.2Mbps HSUPA 5.76Mbps, WiFi, Bluetooth V4, microUSB 2.0 with OTG support and FM radio. The Micromax Funbook P410 Mini comes in white color and is priced at RS 8,820. It will be soon available from online retailer as well as from company authorized dealers across the India.